A flood myth or deluge myth is a narrative in which a great flood, usually sent by a deity or deities, destroys civilization, often in an act of divine retribution. Parallels are often drawn between the flood waters of these myths and the primeval waters found in certain creation myths, as the flood waters are described as a measure for the cleansing of humanity, in preparation for rebirth. Most flood myths also contain a culture hero, who "represents the human craving for life". 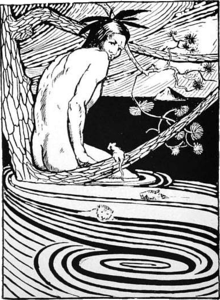 The flood myth motif is found among many cultures as seen in the Mesopotamian flood stories, Deucalion in Greek mythology, the Genesis flood narrative, the Hindu texts from India, Bergelmir in Norse Mythology, and in the lore of the K'iche' and Maya peoples in Mesoamerica, the Lac Courte Oreilles Ojibwa tribe of Native Americans in North America, the Muisca, and Cañari Confederation, in South America. The Mesopotamian flood stories concern the epics of Ziusudra, Gilgamesh, and Atrahasis. In the Sumerian King List, it relies on the flood motif to divide its history into preflood (antediluvian) and postflood periods. The preflood kings had enormous lifespans, whereas postflood lifespans were much reduced. The Sumerian flood myth found in the Deluge tablet was the epic of Ziusudra, who heard the Divine Counsel plan to destroy humanity, in response to which he constructed a vessel that delivered him from great waters. In the Atrahasis version, the flood is a river flood. In the Genesis mythology of the Hebrew Bible, Yahweh (God) decides to flood the earth because of the depth of the sinful state of mankind. Righteous Noah is given instructions to build an ark. When the ark is completed, Noah, his family, and representatives of all the animals of the earth are called upon to enter the ark. When the destructive flood begins, all life outside of the ark perishes. After the waters recede, all those aboard the ark disembark and have God's promise that he will never judge the earth with a flood again. He gives the rainbow as the sign of this promise. In the 19th century, Assyriologist George Smith translated the Babylonian account of a great flood. Further discoveries produced several versions of the Mesopotamian flood myth, with the account closest to that in Genesis found in a 700 BCE Babylonian copy of the Epic of Gilgamesh. :20 In this work, the hero, Gilgamesh, meets the immortal man Utnapishtim, and the latter describes how the god Ea instructed him to build a huge vessel in anticipation of a deity-created flood that would destroy the world. The vessel would save Utnapishtim, his family, his friends, and the animals. Matsya-avatara of Lord Vishnu pulls Manu's boat after having defeated the demon. In Hindu mythology, texts such as the Satapatha Brahmana and the Puranas contain the story of a great flood, wherein the Matsya Avatar of Vishnu warns the first man, Manu, of the impending flood, and also advises him to build a giant boat. 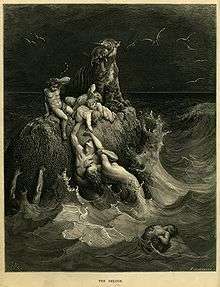 In Plato's Timaeus, Timaeus says that because the Bronze race of Humans had been making wars constantly Zeus was angered and decided to punish humanity by a flood. Prometheus the Titan knew of this and told the secret to Deucalion, advising him to build an ark in order to be saved. After 9 nights and days, the water started receding and the ark was landed at Mount Parnassus. Nanabozho in Ojibwe flood story from an illustration by R.C. Armour, in his book North American Indian Fairy Tales, Folklore and Legends, (1905). After kingship came down from heaven .... the kingship was taken to Shuruppak. In Shuruppak, Ubara-Tutu became king; he ruled for 5 sars and 1 ner. In 5 cities 8 kings; they ruled for 241,200 years. Then the flood swept over. Excavations in Iraq have revealed evidence of localized flooding at Shuruppak (modern Tell Fara, Iraq) and various other Sumerian cities. A layer of riverine sediments, radiocarbon dated to about 2900 BC, interrupts the continuity of settlement, extending as far north as the city of Kish, which took over hegemony after the flood. Polychrome pottery from the Jemdet Nasr period (3000–2900 BC) was discovered immediately below the Shuruppak flood stratum. Other sites, such as Ur, Kish, Uruk, Lagash, and Ninevah, all present evidence of flooding. However, this evidence comes from different time periods. Geologically, the Shuruppak flood coincides with the 5.9 kiloyear event at the end of the Older Peron. It would seem to have been a localised event caused through the damming of the Kurun through the spread of dunes, flooding into the Tigris, and simultaneous heavy rainfall in the Nineveh region, spilling across into the Euphrates. In Israel, there is no such evidence of a widespread flood. Given the similarities in the Mesopotamian flood story and the Biblical account, it would seem that they have a common origin in the memories of the Shuruppak account. Floods in the wake of the last glacial period may have inspired myths that survive to this day. It has been postulated that the deluge myth in North America may be based on a sudden rise in sea levels caused by the rapid draining of prehistoric Lake Agassiz at the end of the last Ice Age, about 8,400 years ago. The geography of the Mesopotamian area was considerably changed by the filling of the Persian Gulf after sea waters rose following the last ice age. Global sea levels were about 120 m (390 ft) lower around 18,000 BP and rose until 8,000 BP when they reached current levels, which are now an average 40 m (130 ft) above the floor of the Gulf, which was a huge (800 km × 200 km (500 mi × 120 mi)) low-lying and fertile region in Mesopotamia, in which human habitation is thought to have been strong around the Gulf Oasis for 100,000 years. A sudden increase in settlements above the present water level is recorded at around 7,500 BP. Another hypothesis is that a meteor or comet crashed into the Indian Ocean around 3000–2800 BC, created the 30-kilometre (19 mi) undersea Burckle Crater, and generated a giant tsunami that flooded coastal lands. One of the latest, and quite controversial, hypotheses of long term flooding is the Black Sea deluge hypothesis, which argues for a catastrophic deluge about 5600 BC from the Mediterranean Sea into the Black Sea. This has been the subject of considerable discussion. 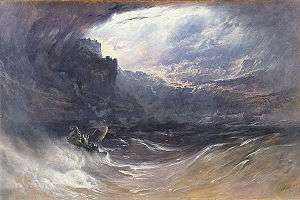 A world-wide deluge, such as described in Genesis, is incompatible with modern understanding of natural history, especially geology and paleontology. To compare: some of the largest tsunamis in history, resulting from the Chicxulub impact, 66 million years ago, were thought to have affected roughly the entire Americas (or nearly all of the Western Hemisphere). ↑ Leeming, David (2004). "Flood | The Oxford Companion to World Mythology". Oxford University Press. Retrieved 17 September 2010. ↑ Cotter, David W. (2003). Genesis. Collegeville, MN: Liturgical press. p. 49. ISBN 0814650406. ↑ Cline, Eric H. (2007). From Eden to Exile: Unraveling Mysteries of the Bible. National Geographic. ISBN 978-1-4262-0084-7. ↑ Pritchard, James B. (ed. ), Ancient Near Eastern Texts Relating to the Old Testament (Princeton, NJ: Princeton University Press, 1955, 1969). 1950 1st edition at Google Books. p.44: "...a flood [will sweep] over the cult-centers; to destroy the seed of mankind; is the decision, the word of the assembly [of the gods]." ↑ Klostermaier, Klaus K. (2007). A Survey of Hinduism. SUNY Press. p. 97. ISBN 0-7914-7082-2. ↑ Sehgal, Sunil (1999). Encyclopaedia of Hinduism: T–Z, Volume 5. Sarup & Sons. p. 401. ISBN 81-7625-064-3. ↑ "Biblical-Type Floods Are Real, and They're Absolutely Enormous". DiscoverMagazine.com. 2012-08-29. Retrieved 2015-08-18. ↑ Mayor, Adrienne (2011). The First Fossil Hunters: Paleontology in Greek and Roman Times: with a new introduction by the author. Princeton: Princeton University Press. ISBN 0691058636. ↑ Carney, Scott (November 7, 2007). "Did a comet cause the great flood?". Discover Magazine. Retrieved 17 September 2010. ↑ Sarah Hoyle (November 18, 2007). "Noah's flood kick-started European farming". University of Exeter. Retrieved 17 September 2010. ↑ Montgomery, David R. (2012). The Rocks Don't Lie: A Geologist Investigates Noah's Flood. Norton. ↑ Weber, Christopher Gregory (1980). "The Fatal Flaws of Flood Geology". Creation Evolution Journal. 1 (1): 24–37.